Create a grid that is as wide as the penalty box, and approximately 25-30 yards from goal. Split the remaining players into two groups (Red and Yellow). The two groups will line up on opposite sides of the file on the cone set farthest from the goal. Make sure that every player has a ball. On the coach's command, the first player in the Red group dribbles the ball with speed at the edge of the penalty box and quickly has a shot as they approach. Immediately after the Red player shoots, the first player from the yellow group dribbles at the penalty box as the Red player defends his attempt. 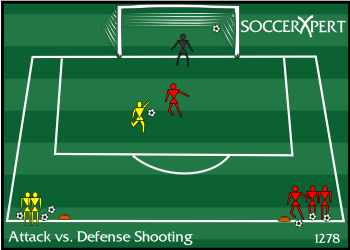 After the Yellow player shoots, they immediately defend the next red player who is now attacking. Repeat this rotation throughout the drill. Put the shot on target even when under pressure.